Okay, I understand that many religions have sacred garments. We even see this in the Bible. I just find that all the Mormon secret rituals seem like a creative blend of Masonic rites, pagan practices and pseudo-Christian terminology. I kind of like that everyone can wear the garments not just the priests or religious leaders. This reflects a tradition that understands the importance of the priesthood of the ordinary person. But I do believe that the sacred garments also highlight what is wrong with the Mormon religion. LDS teaching misappropriate Biblical truths. Mormons shroud their lies in mystery, symbols and secret ceremonies. What some think of as weird or comical; others take very seriously. Christians should work to understand the real implications of LDS teaching and be prepared to uncover the lies that they spread door-to-door across the country. When you understand the real implications of people trusting in holy underwear and works for salvation instead of the blood of Jesus, you see that sacred britches are no laughing matter. One of the most fascinating places that I visited on my trip to Morocco last summer was a small town called Moulay Idriss. It is a northern city known as a spiritual retreat for Muslims seeking enlightenment and direction. The city is small, built on a hill with lots of close quarters and streets that wound around each other. 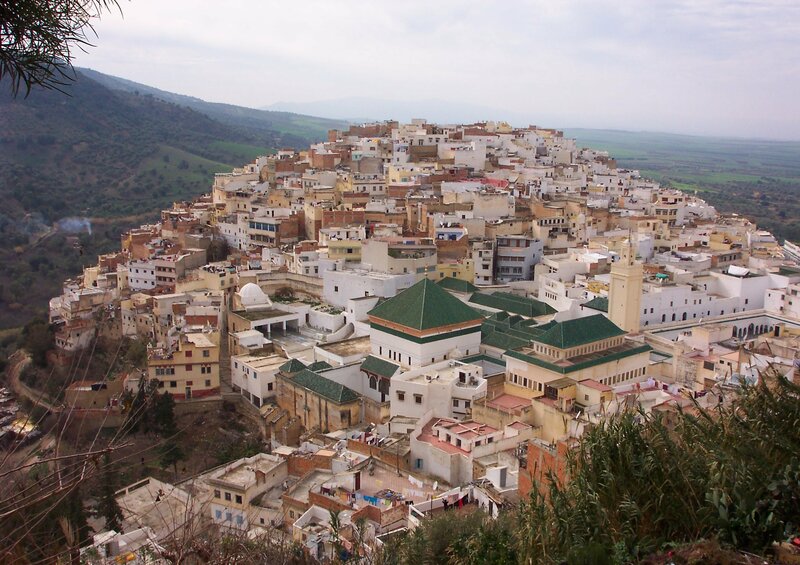 Moulay Idriss has a very rustic and mystical feel to it. Many Moroccan Muslims come here if they can’t afford to go to Mecca on pilgrimage. The city is named after its founder who is considered to be a pioneer of Islam in the country as well as a distant relative of Muhammad. Moulay Idriss is buried in the city. Many people come there to pray, burn candles and celebrate some of the more mystical side of Islam. Just like in Christianity, there are a wide variety of divisions and differences between various branches of Islam. It just to happens that in Morocco, the religion has been somewhat combined with modern customs and ancient, mystical traditions. My friends and I were there as Westerners and Christians. We enjoyed talking with the people in the town and even found a local teenage boy to help show us around. The entire time I felt a darkness to the town. I didn’t see any other foreigners in the town except us. Everyone knew that we didn’t belong. This feeling got worse as we approached the mosque in the center of the town next to the tomb of Moulay Idriss. As non-Muslims, we did not enter the holy site out of respect for the religion. At the entrance was a bar that stood about waist high. The bar was a line of demarcation. By bending down to enter, you are in essence saying that you submit to Allah as god and are a good Muslim. Of course, we were not prepared to do that. Looking at that bar as if it would cut me in half if I entered, I began to understood the chasm between me and the Muslims in Morocco. My heart went out to them as I watched person after person bend under the bar to enter. They went somewhere that I couldn’t go. And I wished they would realize it was a dead end. I silently prayed for everyone that passed me that day. My experience at the bar is something that I will never forget because it reminds me why Christians should support missions, pray for the lost and be witnesses of Christ’s love wherever we go. The next several posts are based on experiences from my trip to Morocco last summer. I went on a humanitarian aid trip to work at an orphanage. While in Morocco, I also did a lot of prayer and intercession for the country. One of the first places I had a chance to pray was at the Hassan II Mosque in Casablanca. Built on the coast of the Atlantic Ocean, the mosque is one of the largest in the world. It is certainly the largest mosque that is open to non-Muslims. The structure was very impressive although it felt empty to me. While praying outside of the mosque near the ocean, I noticed all the fallen stones and construction equipment near the base of the structure. It looked like there was a massive project underway to reinforce the base of the mosque. I wondered if this was a prophetic picture of Islam in Morocco. Later that day, I met up with a friend who is doing humanitarian work in the country. He said that the mosque is literally falling into the ocean. This comment came completely unprompted by me. Then, my friend said that he believes this is a prophetic picture of Islam compared to the might waves of the Christian message about Jesus Christ. In His most famous sermon, Jesus warned about building on the sand and not the firm bedrock of His words. Islam is built on the sand because it denies Christ’s work on the cross. It encourages human efforts to appease a very demanding sense of god. Islam is very strong in the Middle East. But there are cracks in the foundation that are starting to give way under pressure of a world that doesn’t make sense apart from Jesus Christ. My hope is that many come to know that we all can be guaranteed of salvation through Jesus. I agree with Islam that God is great, mighty and beyond anything we can imagine. I disagree with Islam that we can do anything to bridge the gap between us and God except believe on His Son. The five pillars of Islam are nothing more than human striving in religious language. Grace is the thing that makes Christianity different. What is the foundation of your life? Is it secure? For some reason, I seem to be on a cult leader kick lately. Jose Luis de Jesus Miranda is quite a character. He claims to be Jesus in the flesh. He encourages his followers to get 666 tattooed on their body. He encourages his disciples to be party animals. Oh, Jose Luis denies the existence of hell too. No wonder the Scriptures warn about false teachers in the later days. The USA seems to be full of them. I think Jose may be my favorite wacko cult leader yet. He has a lot of chutzpah. I’ll give him that.